The Chennai Super Kings took on the Kolkata Knight Riders in the 23rd match of the IPL 2019. This time it was quite a low scoring game at the MA Chidambaram Stadium as the Kolkata Knight Riders could only score 108 runs on the board. After winning the toss, MS Dhoni invited Kolkata Knight Riders to bat first. At the visitors were losing wickets at the snap of their fingers and Andre Russell was the only one who stayed till the end scoring 50 runs. Deepak Chahar and snapped three wickets. Harbhajan Singh and Imran Tahir both got a couple of wickets each. Ravindra Jadeja snapped one wicket. CSK beat KKR by 7 wickets. Six wickets fell in the power play for the Kolkata Knight Riders. In return, Chennai Super Kings started off losing Shane Watson quite easily in the game. It was Sunil Narine who got the first breakthrough of the match as he snapped the wicket of Watson. The Australian got out on 17 runs. Suresh Raina and Ambati Rayudu got on 14 and 21 runs respectively. Faf Du Plessis and Kedar Jadhav took the team to the finishing line and made the total in 17.2 overs. 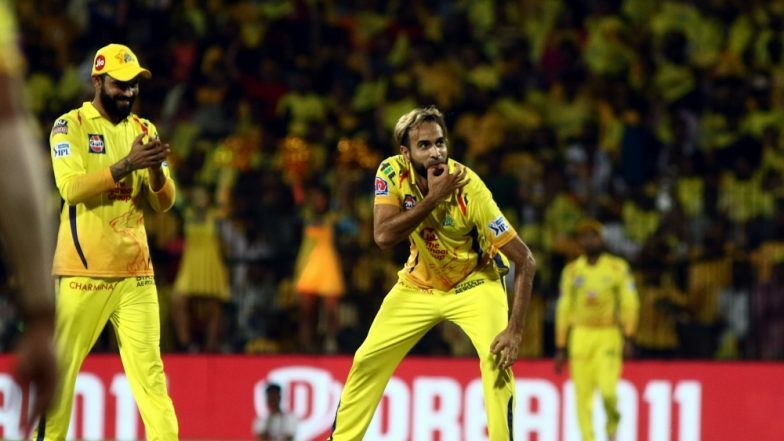 IPL 2019 Purple Cap Winner Updated: CSKs Imran Tahir Overtakes Yuzvendra Chahal to be the Second Most Leading Wicket-taker in Indian Premier League 12. Now let’s check out a few stats of the match. # Andre Russell went on to become the leading six-hitter of the IPL 2019. He has slammed 25 sixes in the tournament so far. # It was the first time since 2011, that a team has lost six wickets in the power play. # Andre Russell scored his sixth fifth of the IPL. Deepak Chahar went on to become the Man of the Match. “I think I knew we are going to play a lot of games at Chennai. So, I worked on my slower ball and Yorkers,” he said during the post-match presentation. Chennai Super Kings will next play the Rajasthan Royals on Thursday in Jaipur.